Cut Food Prep Time In Half! Save time and effort in the kitchen by using this versatile food slicing tool to cut, chop, grate or julienne all your veggies to perfection! Keep Your Fingers Safe:Featuring a safe finger guard that securely grips on the veggies to protect your hands from accidental cuts, this professional kitchen slicing tool will let you cut your vegetables to perfection effortlessly! 2 In 1 Detachable Food Container for Mess Free Food Prep and Space Saving Storage:The attachable food container will catch and store every slice and shred. Super easy to set up and clean, just rinse under running water after use. A perfect gift for moms, friends, cooks and health-conscious people, making their life in the kitchen fun and convenient. SAVE TIME AND EFFORT: This hand-held mandoline slicer will cut your prep time in half, by cutting through potatoes, onions, cheese and vegetables with ease. Your kitchen will be clean and tidy thanks to the container. 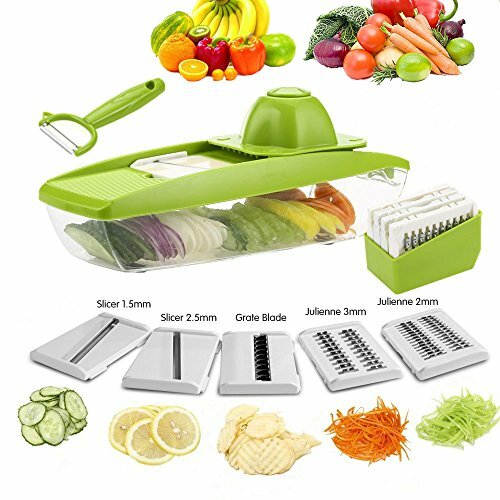 EASY TO USE: Mandoline slicer can be used for slicing, grating and shredding, perfect for tomato, carrot, cucumber and onion slice. Save your prep time, make dishes easy and fun. It's a perfect gift for Moms, cooks and healthy-conscious. MULTITASK: 5 interchangeable sharp blades made from high quality stainless steel, you can use it to chop various vegetable or fruits. Blades are easy to change so you don't have to worry about cutting yourself. EASY TO CLEAN: Simple design of the slicer makes it possible to quickly and easily clean up. Simply put it into the dishwasher or rinse in the sink. SAFE - USING: Featuring a safe finger guard that securely grips on the veggies to protect your hands from accidental cuts, this professional kitchen slicing tool will let you cut your vegetables to perfection effortlessly! If you have any questions about this product by ZX-HOME, contact us by completing and submitting the form below. If you are looking for a specif part number, please include it with your message.